I was excited to participate in the paged media workshop, because my Shuttleworth Foundation fellowship was about how to create open learning content that can be customized and used in ways that increase its value to faculty and students (remixing). Being able to publish directly to the web in native web formats makes that remixing more feasible. 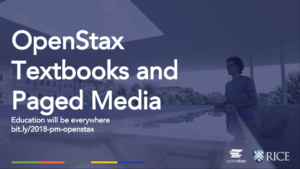 OpenStax, where I work now, creates openly-licensed textbooks (CC-BY) that are first professionally developed to meet the needs of college courses, and then shared. Each subsection of a chapter of a book (a few pages treating one or two concepts) is its own remixable ‘module’. Those subsection modules make it possible to create a print, web, and mobile book more flexibly, but also makes it more complex. And students use all formats simultaneously. We want to let them get the most from the strengths of each format (reading in print, working simulations on the web, and reviewing on their phone) without becoming hopelessly confused when their instructor asks them to do HW problems 5, 9, 11, and 15 or read pages 79-88. So paged media is one way we can approach unifying (while not constraining) those formats. My presentation from the workshop covers extensive examples of OpenStax’s Sociology textbook in many different formats and locations and then looks at the ways that we use css and transforms to create print and web versions of the books that can be used coherently together. And these raw notes from the workshop have a bit from each of the presentations.